Capt. Edward H. Lundquist, USN (Ret): How would you describe your mission? 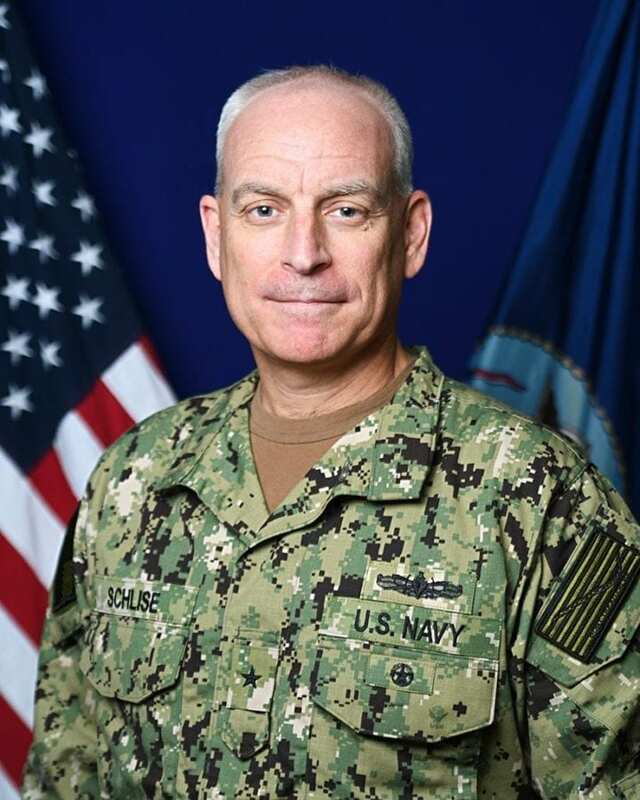 Rear Adm. Paul Schlise, USN: Strategically, the U.S. 5th Fleet is preserving the free flow of commerce and freedom of navigation through three critical chokepoints. The Strait of Hormuz is a huge throughput point for about a third of the world’s daily oil production. It’s less through the Bab el-Mandeb strait between the Red Sea and the Indian Ocean. But the vast majority of the oil flowing through the Strait of Hormuz goes to Asia. And the U.S. 5th Fleet is here to maintain that free flow of international commerce through those straits and chokepoints. That’s why we’re here and on watch 24/7/365. It’s a team effort. The Commander of U.S. Naval Forces Central Command is also Commander U.S. 5th Fleet, and Commander Combined Maritime Forces. The CMF includes the commanders of Task Force 150, 151, 152. Currently all three task forces are commanded by the GCC (Gulf Cooperation Council countries). 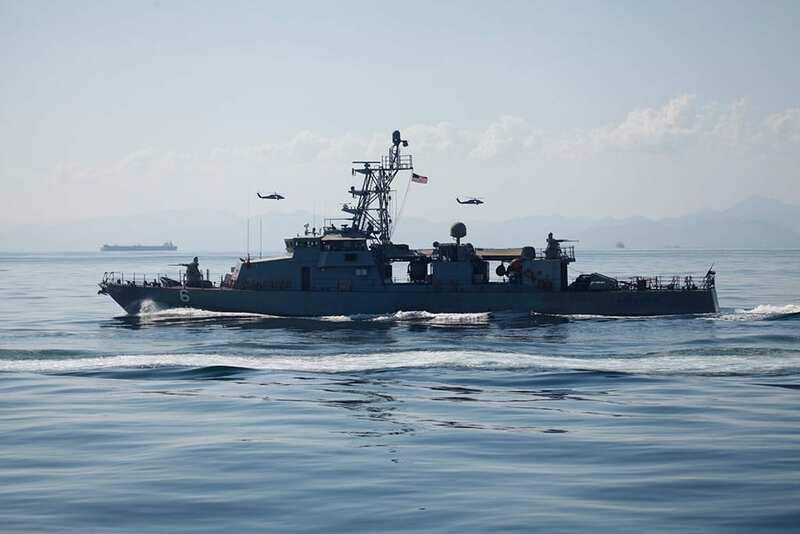 The Kuwaitis have 151, the Saudis have 150; and the Kuwait Coast Guard has 152, which is the Maritime Security Task Force inside the Arabian Gulf. What forces do you have to carry out that mission? Most of the naval forces available to 5th Fleet are rotational. We get ships and aircraft squadrons from both the east and west coast, including carrier strike groups, amphibious ready groups, and rotational P-3 Orion maritime patrol aircraft squadrons—we’ll get the P-8 Poseidon next year. And then we get some independent players. There is an enduring requirement for ballistic missile defense capable DDGs here, so we get those on a rotational basis and they will typically come without a strike group. When we get a carrier strike group, it will typically bring about four escorts, including guided missile cruisers and destroyers, and we put them to good use. Some of them will stay with the carrier, and some will spread out and do other business around the theater. USS The Sullivans is an example of a multi-mission ship, providing ballistic missile defense for the region while also escorting USS Essex while the amphibious assault ship is flying F-35 missions in Afghanistan. That’s the beauty of the multi-mission ship, doing a lot of different things on any given day. We have our Bahrain home-ported force of ten PCs; four MCMs; and six Coast Guard WPBs – which are 110-foot Coast Guard cutters. They’re super capable. We keep all those ships really busy. So these smaller combatants have an outsized mission in the region. They are experts in interactions with the local fishing boats and dhows that are trading in the Gulf. When we talk about our interactions with the Iranians, they know just how to do their business out there. Our crews live here and they’re out interacting with them on a practically daily basis. The PCs, WPBs and MCMs are relatively old. Correct, and they are operating a lot. There’s a proposal to replace the WPBs with the Coast Guard’s new Fast Response Cutter. But keeping these older platforms going has some challenges. The heat’s a factor out here, too. It’s tough on equipment. The higher seawater injection temperatures make the AC plants work harder, for example. And that’s something that just comes with the territory. The water temperature is very warm, and it’s prone to a lot of sea growth. With the biofouling, you have to clean your seawater systems more often. So they’ve got to lean into it more so than in places like Norfolk or San Diego where the water is cooler. Altogether it necessitates a little longer time in shipyard periods to get some maintenance done. We’ve gotten after the maintenance and the needles are starting to point in a good direction there because of some great work by our waterfront team led by our Task Force Commanders and Surface Squadron FIVE. Do you find that the ships that are coming to you from CONUS are certified, qualified, and ready to go to do whatever the mission is that you have for them here? We do. Each ship is different, of course. But they all have to meet the training standard to certify for deployment. And we’ve tinkered with that a little bit since the Comprehensive Review was completed. Our SWO Bosses, Vice Adm. Brown and Rear Adm. Wilson, have been central to making these adjustments to our pre-deployment training. And we never stop training, either. For example, all of the amphibious ready groups that come here will conduct what we call TACR – Theater Amphibious Combat Rehearsal, which takes place off Djibouti. We’ve got some great relationships with the Djiboutian Armed Forces down there, and they help us out a lot. During the transit, the Marines may have done a lot of PT and cleaned their weapons, but they haven’t honed their amphibious warfare skills. The TACR sharpens their amphibious war fighting skill sets, and resets all their clocks. They get all the vehicles out, all the aircraft, and get everything ashore for a full-on amphibious assault. There’s live-fire associated with it. It’s a soup-to-nuts amphibious training exercise with both sea and air-based assaults. We also have training exercises for the surface combatants that deploy here. Our DDGs and cruisers are involved with these all the time – from supporting our fellow component commanders during air- and missile-defense exercises, to full-spectrum surface warfare training exercises with our coalition partners from all around the region.